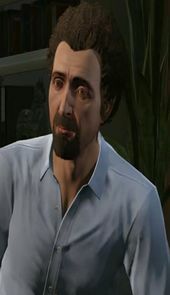 Dr. Isiah Friedlander is a character in the HD Universe appearing in Grand Theft Auto V.
Dr. Friedlander is a licenced therapist. He is based out of Mount Zonah Medical Center; however, Dr. Friedlander operates his practice from a beach front house in Del Perro Beach. Michael De Santa is one of Dr. Friedlander's patients. At certain points during the game, the player may visit Dr. Friedlander's office or choose to do an over-the-phone session, and the player can accept or reject the doctor's advice. In his final session with Michael, Dr. Friedlander reveals to Michael that he can't be his therapist anymore, and that he's going to be a TV star, using his sessions with Michael to sell the show. Dr. Friedlander hastily flees his office, and Michael has a choice to either let him go or kill him. If spared, a Weazel News report reveals that Dr. Friedlander was murdered, most likely by another former patient holding a grudge, before his TV show could air. Dr. Friedlander is a parody of typical Hollywood psychotherapists, caring more about making money than helping his patients and shows little to no reaction whenever Michael outright admits he killed people. The first session costs $500; however, subsequent sessions increase in price. A family group session cost Michael $4,000. Dr. Friedlander usually keeps the sessions short, typically cutting them off whenever Michael is about to have an epiphany to ensure that Michael returns to pay him another fee. Dr. Friedlander bears a slight resemblance to famous painter and TV personality Bob Ross. When the player completes the final mission, they receive a psychological evaluation from Dr. Friedlander's office, outlining the player's spending habits and how time outside of missions was spent. This page was last modified on 9 May 2014, at 21:44.